Tell your friends about the garden and encourage them to come by. Roll up your sleeves and join us as a Volunteer on Open days. If you own a business in the neighborhood, consider making a donation. Most of all, remember to stop by often and refresh your spirits. 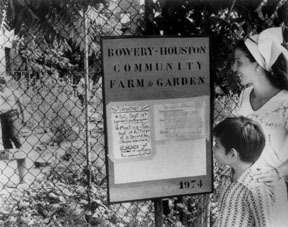 This was the First Community Garden in New York City founded in 1973; it is located on the northeast corner of Bowery and Houston Streets in Manhattan. In 1973 a local resident named Liz Christy and a group of gardening activists known as the Green Guerillas were planting window boxes, vacant lots with seed bombs and tree pits in the area. They saw the large rubble-strewn lot as a potential garden and in December went to the City to find a way to gain official use of the land. Volunteers hauled the garbage and rubble out, spread donated topsoil, installed a fence and began planting. Soon the Green Guerillas were running workshops and planting experimental plots to learn how a wide range of plants could be grown in hostile conditions. The garden became a site for many plant giveaways, where plants grown on-site or donated from nurseries, professional horticulturists and local gardeners were given to new gardens all over the City. In 1986 the Garden was dedicated Liz Christys Bowery-Houston Garden, in memory of its founder. In 1990, after years of uncertainty and a ground swell of support, the local development group, the Cooper Square Committee, pledged to preserve the garden in its entirety in its renovation plans for our neighborhood. The 2002 agreement between the City of New York and the NYS Attorney General calls for the preservation of the Liz Christy Garden. Sun bath, read, bird watch, stroll, relax, listen, smell and otherwise enjoy the garden. Dogs must be kept on the paths and under no circumstances may visitors pick, or cut flowers or plants in the garden, nor should visitors ever walk into any garden plot unless they have the individual gardeners permission to enter their garden area. Please do not add any additional fish or turtles to the pond as it can only safely support the current population. Please do not pick the flowers at our garden, leave them for everyone to enjoy. The garden may inspire you to have a flower you saw at our garden so just ask a gardener what it is and try to find it at the local Greenmarkets.